Flowers aren’t the only things popping up this spring. So are great deals on Amish furniture at the Weaver Spring Sale. Save up to 70% off closeout items, plus enjoy other big savings storewide. The Save 70% Weaver Spring Sale event runs daily, from 9 a.m. to 5 p.m now through April 15. (except April 7 and 14 – both Sundays). So visit Weaver’s 20,000 sq. ft. facility in Shipshewana, Indiana. And save big! Big savings are popping up through the store during the Weaver Spring Sale. They include a whopping 70% off select closeout items. Also, you can save 20% off crafts and home accessories. In addition, all items across the store are going for 15% off. You can also save 10% off custom orders. These discounts are not valid with any other promotions. Purchase Amish furniture, such as the Santa Fe Dining Room Collection, during the Save 70% through April 15 in Weaver Spring Sale. Weaver Furniture Sales is offering special financing, subject to credit approval. However, creditors will need to make monthly payments. Sales associates can provide additional information. While at the sale, sign up for a chance to win great prizes. They include a recliner and gift cards for $100, $75 and $50. Also, the store will provide free snacks and drinks on Friday and Saturday, April 12 and 13. Enjoy! Bring nonperishable canned food items and Weaver Furniture Sales will donate the items to Clothes & Food Basket of LaGrange County, Indiana. 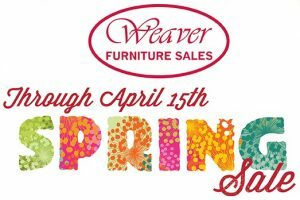 Better yet, donate three or more canned food items and you’ll receive an additional discount off purchases during the Weaver Spring Sale. Weaver Furniture Sales is a Shipshewana Furniture Store located 1/4 mile south and 1/4 mile east of the junction of State Road 5 and US 20 in Shipshewana, Indiana. Weaver Furniture Sales was established in 1989 in Shipshewana, Indiana. They are a Amish, family-owned furniture business. 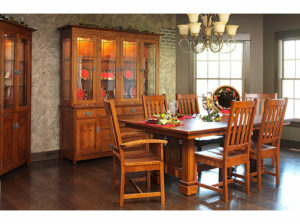 Weaver Furniture Sales offers a full line of solid wood, Amish furniture at affordable prices. They cater to both residential and commercial customers. The company features Shaker, Mission and Traditional furniture styles. As part of their client services, they provide furniture design consultation services, custom furniture options, furniture quotes, layaway options and various delivery alternatives for residences and businesses in the United States.